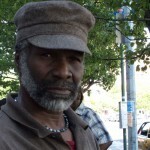 Hans Modeste, a street vendor in Harlem, said that new residents don't care about how different Harlem is now. "They will never know the Harlem that I know." Harlem, New York — He calls himself Hans. 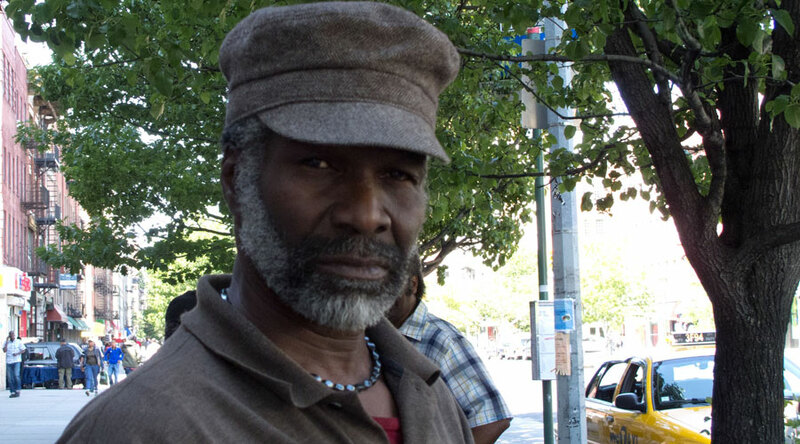 An artist and businessman, Hans Modeste, 60, sells jewelry, music, and replicas of ornaments from ancient Egypt on the corner of West 126th Street and Lenox Avenue in Harlem. “I work a lot with my hands,” Modeste said, “so I call myself Hans.” Modeste sits down next to a table that displays his merchandise. With calloused fingers, he picks up his latest art project, a paper mache alligator. On his table are several miniature pyramids and tiny busts of Queen Nefertiti. Surrounded by vinyl records and pictures of Bob Marley, Modeste says he’s lived in Harlem for most of his life, though he is originally from Grenada. Fifteen years ago, he left the neighborhood and moved to the Bronx. “Now the rent’s too high,” said Modeste. He says he cannot afford to move back. Once a non-commercial haven for cheap apartments and street vendors like Modeste, Harlem is now host to big box retail chains, luxury apartment buildings, and dozens of upscale restaurants similar to those found in downtown Manhattan. Modeste’s business seems worlds apart from what’s sold just up the street in stores like Staples, Dunkin’ Donuts, Marshalls and a CVS. Nearby are two new posh restaurants. One is Red Rooster, where President Obama ate last year. The other is Chez Lucienne, with Hors D’Oeuvres and $14 Salmon burgers on the menu. Four blocks away is The Lenox, a new luxury apartment building with some units going for over $1 million. Average household income in the neighborhood also reflects the shift in tastes. The median income for a central Harlem household in 1989 was, in 2009 dollars, $24,000. In 2009, it was $45,000. Many people welcome this new Harlem. Anahi Angelone, the owner of the Corner Social, a new bar and restaurant on the same corner Modeste sells his art, is one of them. “I fell madly in love with the neighborhood,” said Angelone, 31, who moved here two years ago. So far, she says, the idea seems to be working. On a recent Tuesday night, men in neckties and blazers, and women in three-inch heels sat at polished wooden tables. Paintings of old Harlem decorated the walls in the back. The price of a cocktail: $12. For a beer, it’s $7 to $12. “It’s a much needed place,” said Michele Ivey, 43, who works in marketing. But some longtime Harlem residents like Modeste aren’t so enthusiastic about the neighborhood’s newest establishment or its polished wooden seats and $12 cocktails. They aren’t too happy about how the neighborhood has changed either. Rising rents, and the loss of small, community friendly shops leave people like Modeste displaced. They are unable to participate in Harlem’s contemporary grandeur—but they don’t want to let go of their old ways either. Tony Muñoz, who has lived in east Harlem since the 1980s, also does not like a lot about his neighborhood’s new vibe. “Now you see dogs running around Marcus Garvey Park,” Muñoz, 53, said. Those that came of age in Harlem might remember that the Corner Social on Lenox Avenue used to be a scented oil shop called Scents of Nature. A little over a decade ago ‘mom and pop’ stores dotted the blocks around 125th Street. Running from east to west, 125th Street is considered the heart of Harlem. It’s home to the Apollo and the Victoria Theater, and the Studio Museum in Harlem. Residents fear this legacy will be lost as the neighborhood shifts, explains Washington. New places like the Corner Social give the newcomers a chance to form their own heritage, their own traditions and lifestyle. All of this is done to promote consumerism, Washington believes. The result is higher rent and new luxury condominiums, starting at $500,000. “You are going to price people out. Vendors are not going to stay,” Washington said. But for now, he can’t ever imagine his life without Harlem. Everyday he still travels to his old stomping grounds to set up shop on the sidewalk. Modeste puts down the paper mache alligator when a woman stops to look at his table. No sale. He hasn’t sold anything yet today. “Harlem is home,” said Modeste, shrugging his shoulders.